Squaw Valley’s Bryce Bennett, shown training at Copper Mountain, Colorado in 2018, matched his career-best finish with a fourth place in Bormio, Italy last week. For the second consecutive World Cup downhill event, Squaw Valley’s Bryce Bennett finished just off the podium, matching a career-best fourth place on an icy day in Bormio, Italy to close out 2018. Bennett raced to a time of 1 minute, 55.88 seconds last Friday, and for the second straight race was edged off the podium by Switzerland’s Beat Feuz, who finished 0.15 ahead of Bennett for third place. Feuz, who is the top-ranked downhill skier, beat Bennett by 0.06 at the last downhill event in Val Gardena, Italy. U.S. Ski & Snowboard reported the icy conditions at Bormio made for some of the toughest racing since in the 1990s. 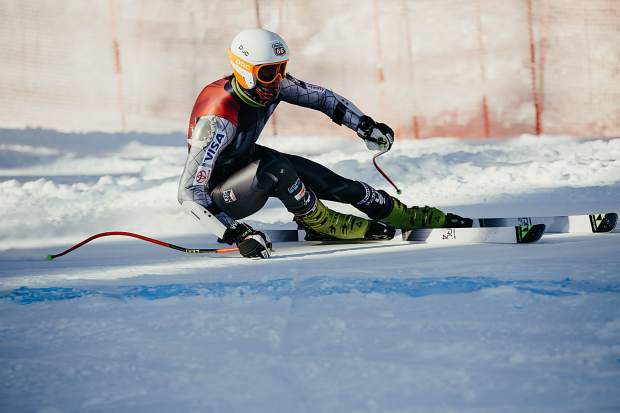 Local athlete Travis Ganong opted out of the event after losing a ski and crashing into the nets in the second downhill training run. Bennett, who was the fastest American on the day, also commented on the conditions following the race at Bormio. Italians Dominik Paris (1:55.21) and Christof Innerhofer (1:55.57) took first and second, respectively. Bennett went on to compete in super-G the following day at Bormio, and finished in 48th with a time of 1:33.90. He is currently the No. 6 ranked downhill skier and No. 29 in the overall standings. Paris picked a second straight win, finishing the event with a time of 1:29.95. Ganong did not start. The next World Cup event will be a slalom race this weekend in Zagreb, Croatia.